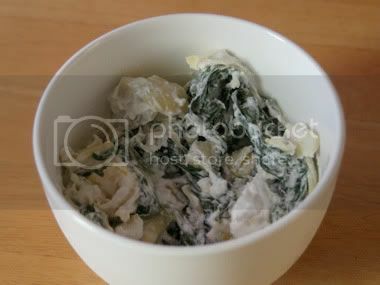 I have a serious weakness for spinach and artichoke dip. But not just any S&A dip. The one at the Hollywood Improv is so damn good, I swear it has crack in it. I'm not joking. There's no other reason for me waking up in the middle of the night, in a cold sweat, jonesing for that dip. I had spinach. I had artichoke hearts. So I attempted to create a simple dip. It didn't taste anything like the Improv's. But it was filling. And I pulled everything out of the fridge. It's a big win when I have a hankering for something and all the ingredients happen to already be in the kitchen. Steam spinach and artichokes in a veggie steamer over boiling water until tender and drain (the spinach will shrink to about 2 cups' worth). Discard liquid. Mix the cheeses, cream, yogurt, and seasoning. Heat for about a minute in the microwave. Stir in the vegetables and serve hot. Yields about 3 small servings. There are a billion variations of this recipe. This is by far the simplest. No baking! It's done within a few minutes. It's a perfect quickie side dish. Or, if you were starving like me when you made it, a filling main dish. One comment/question... seems like it could use a couple more pinches - salt, garlic powder? Lots of cream, but seems like it could use something to bring out the flavors. Haven't tried the recipe yet though, so take my comment with (you guessed it) a grain of salt. Sorry... Couldn't resist. Hey Aaron, thanks for the feedback. If you make it and add a bit more seasoning, let me know. Because the creams/cheeses have a good amount of salt, I found that the dash of seasoning I used was perfect for my taste buds.